Building innovative cooling systems for the hospital, sideline, battlefield, and beyond, WElkins, LLC relies on Smart Products' pumps and check valves to ensure "cooler heads prevail" in their FDA-cleared EMT Temperature Management System and Sideline Cooling System. With a history linked to space age technology, these devices have roots from founder Bill Elkins' work at NASA in the 1960s. Mr. Elkins designed spacesuits, liquid cooled garments, and other life-support systems to help astronauts withstand environmental strain. Almost five decades later, his work has evolved to WElkins LLC, a business dedicated to helping humans survive, perform, and excel during life threatening or extreme conditions. As Christopher Blodgett, WElkins' President, explains, the Temperature Management System provides hospitals and emergency care givers a means of controlling patient temperature in a safe, non-invasive, and effective way across the continuum of care—from the critical minutes after an injury thru to the ICU and recovery. 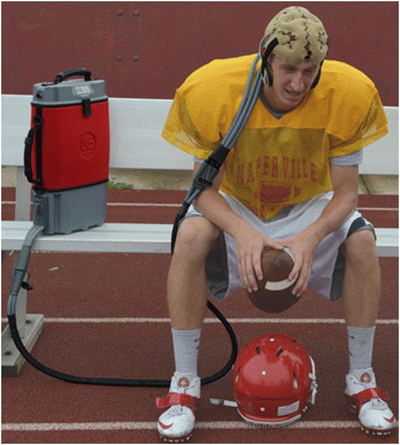 WElkins' Sideline Cooling System is a portable personal cooling device designed to combat heat stress, improve performance, enhance safety and accelerate recovery for athletes of all ages and sports—from running to football to endurance cycling. Smart Product flow control solutions serve as integral parts of both devices' hydraulic and pneumatic subsystems. The Series AP Micro Pumps (pictured) are used to pressurize the heat exchangers, which improves heat transfer. The systems also use several Model #302/302 check valves to regulate coolant flow and pressure throughout. These valves are easily inserted into 1/8" I.D. tubing. For the ability to quickly and consistently identify each valve's purpose, WElkins uses our color coding capabilities. The ability to color code is essential for their inventory and configuration management needs. And, since Series 300 valves are modular, we are able to easily use the same or two different colors for the valve's inlet or outlet (pictured). 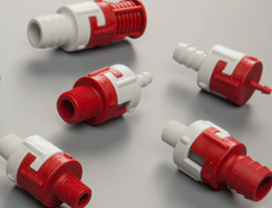 Our standard Polypropylene color availability for Series 300 valves is red, white, or blue. As with all of our valves, we further customize them by o-ring and opening PSI requirements. 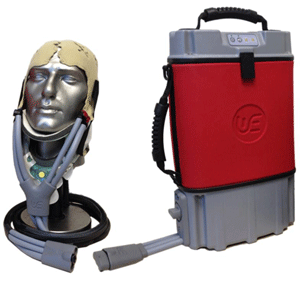 To learn more about these devices, visit http://www.welkinsmed.com/. 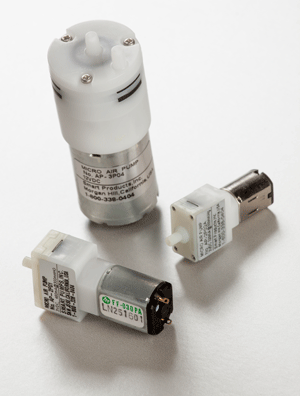 If size, portability, ease of installation, or precise low pressure, low flow control is a critical design concern for your own unique criteria, contact us - we have over three million flexible solutions to meet your application needs.